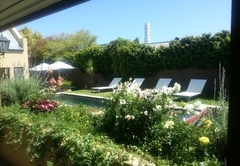 Aloe Guest House Hermanus is one of the Hermanus guest houses and provides accommodation in 5 guest rooms for tourists visiting the Cape Overberg region. 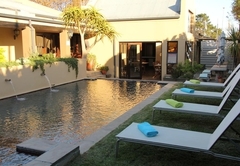 Aloe Guest House offers superb accommodation in the popular tourist destination of Hermanus. 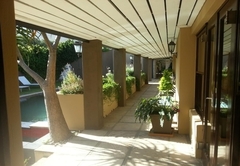 Here you can enjoy luxury accommodation while being close to the many attractions and activities that Hermanus and neighbouring areas have to offer. Wine estates such as Creation and Hermanuspietersfontein are a must visit while here as are the many restaurants in the area. For the more adventurous, you may like to go shark cage diving, play paintball, try a quad bike tour or even a tree top slide. 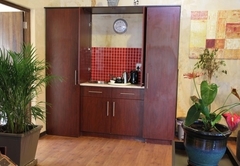 All units have hairdryers, 18 channel TV, heaters / fans, tea and coffee making facilities, fridges, phones and safes. 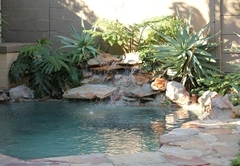 All rooms lead out to the lovely pool area, towels are provided. This suite has a loft bedroom sleeping two guests. There are also two double sleeper couches in the lounge area along with a TV, DVD player, decoder and free Wi-Fi. The unit boasts a desk, a kitchenette without a stove, your own private garden with a patio, barbeque facilities, a six seater table and a rock pool. 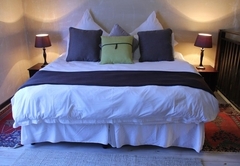 These rooms have a Queen bed, full en-suite bathroom and a sleeper couch in a separate lounge. 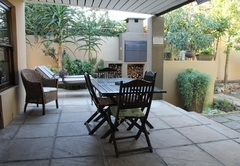 Facilities include a dedicated DStv decoder, Wi-Fi, fridge (honesty bar) and tea & coffee making facilities. This unit has two single beds that can be converted to a king bed with an en-suite bathroom and a double sleeper couch in the separate lounge. 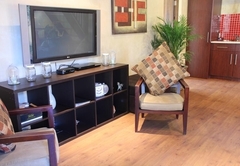 Facilities include a dedicated DStv decoder, fridge (honesty bar) and tea & coffee making facilities. A farmhouse breakfast is included and served each morning in the dining room. 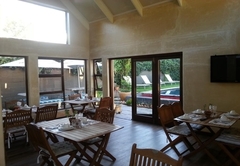 A number of restaurants are in the area where you can enjoy a lovely dinner. 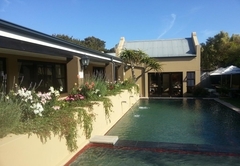 Response timeAloe Guest House Hermanus typically responds to requests in 5-10 minutes.